Added on November 12, 2015 by Spencer Wright. Now as you'll recall, I'm generating these beams (and varying their thicknesses) in nTopology Element, but the method I'm using starts by looking at all the edges in an STL/OBJ that I create in MeshMixer. When I go to generate the lattice (in Element), a beam is created on every triangle edge of the mesh (which I created in MeshMixer). 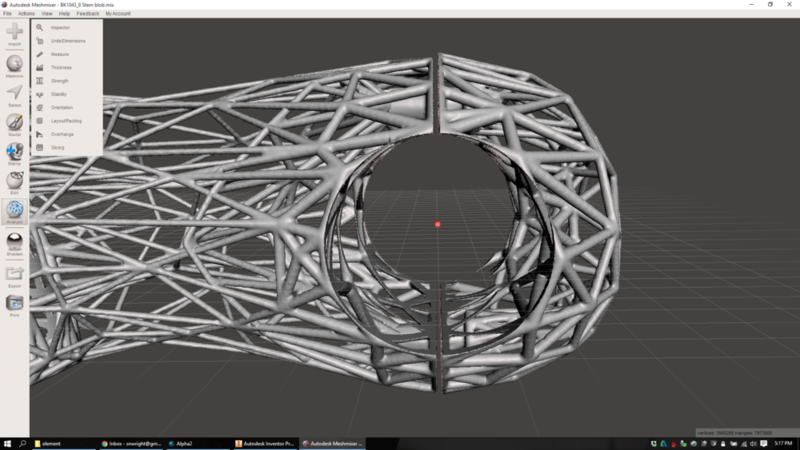 So if I want to control the orientation of the beams in the lattice, I really need to start with that input STL/OBJ. But here's the thing: remeshing algorithms tend to prefer isotropic (equilateral) triangles, which result in a *lot* of beams that are oriented parallel to any given plane (e.g. the build plane). They also prefer nodes that have a valence close to 6 (valence refers to the number of other nodes that a given node is connected to). This is mostly because most remeshers assume that you want to preserve features - a reasonable assumption, in general. But for the vast majority of my design (basically everywhere except the clamp faces and bolt hole features), I care *way* more about eliminating overhanging faces than I do about feature preservation. Anisotropic triangles, specifically ones whose orientation I can set as a global variable. I want my triangles to be longer than they are wide/deep. Nodes with valences <6. This will essentially reduce my beam count (I think). A mesh which is adaptive (as opposed to regular), so that I can preserve my mechanical features (high density mesh) and still reduce beam count elsewhere (low density mesh). I'm also interested in using some curved beams (especially in the clamp areas), but that's prioritized below the things above. Added on November 6, 2015 by Spencer Wright. Note: As before, thanks to Bradley Rothenberg (of nTopology) and Ryan Schmidt (of MeshMixer/Autodesk) for their continued help on this workflow. 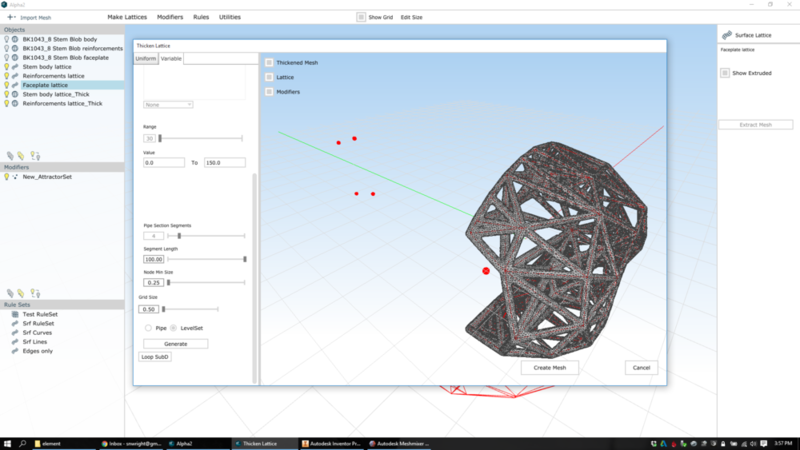 As documented previously (1, 2, 3, 4), I've been working on a multi-step workflow to create printable lattice structures for mechanical parts. 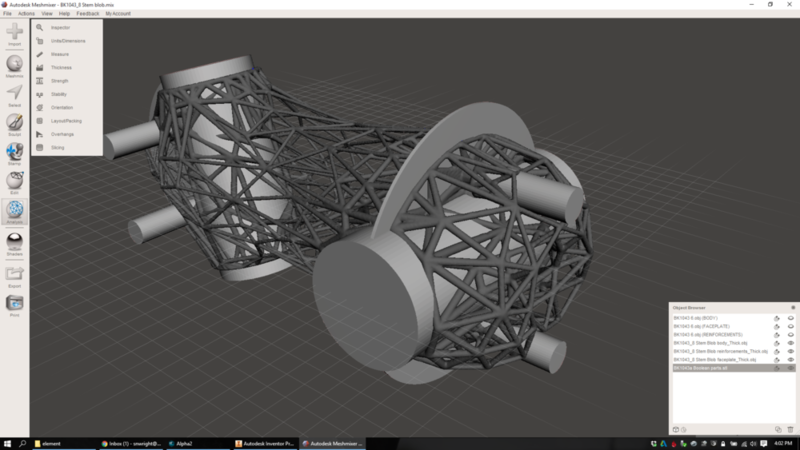 In earlier posts, I described some of the techniques I used to generate the lattice itself, and at this point I'm ready to refine the mechanical features and evaluate the end result. I've made a few changes to my remeshed surfaces since my last post, so I start this process today in MeshMixer. Here I've got three parts: The stem body itself, a surface that's designed to reinforce the threaded portions of the faceplate bolt holes (this is mostly hidden inside the stem body, but you can see its border still), and the faceplate itself. 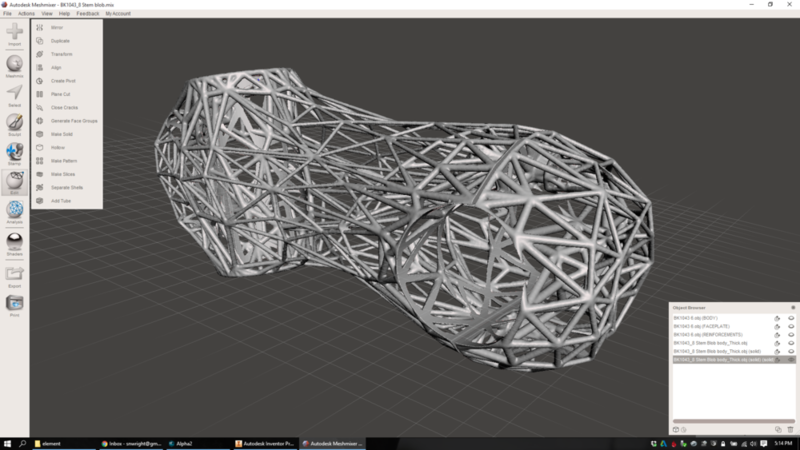 From this, I export three separate OBJ files and import the into nTopology Element. There, I generate simple surface lattices: each edge in the OBJ is turned into a beam in the new lattices. Next, I create a set of attractors that I'll use to control the thickness of my lattice. The locations of these attractors were taken directly from Inventor; I know the XYZ locations of the general areas that I want to thicken, and so put the attractors right where I want them. Then I control each attractor's size and falloff curve to thicken just the areas I want. In the shots below I have every attractor on a cosine falloff; the bolt attractors are 12mm in size, and the clamp cylinder attractors are just a few mm bigger than the diameter of the cylinder. You can see four red dots in the faceplate region (two at the bolt holes and two inside the clamp area). There are also four in the steerer area (with similar locations). The bolt areas are red, meaning the lattice will be the max value in those areas. Everything blue will be at the minimum value, and the other colors are somewhere in the middle. You can see here that each part has some degree of variation in its beam sizes. In the bolt areas the mesh is dense and the beams are thick; in the middle of the stem body the mesh is sparse and the beams are thin. Added on November 3, 2015 by Spencer Wright. XA: It isn't entirely clear for me what guides your remeshing from a mechanical/strength optimization point of view. I get that you are trying to optimize for stiffness so you're trying to maximize the stem virtual hull volume. But this global shape is set at the beginning of your workflow in Inventor. Then you're trying to have an higher lattice density around the mechanical features but how did you set on edges length or thickness. Is it based on gut feeling? If so, do you feel that there will still be a lot of room for weight/mechanical properties optimization? Yeah - you could definitely call my process "emergent." I know that my minimum practical beam size is going to be something greater than .6mm (the exact number is unclear and will require testing). I know that I want to minimize overhanging features, and that it'll probably be appealing (from a cost perspective) to build the main stem body on its end, so that I can pack more of them into a build plate. I also know that the clamp areas will need some significant surface area in order to not, for instance, damage a carbon fiber part that they might be clamped to. I also know that the threaded bolt holes (which will be M4, but which Inventor exports as 3.2mm diameter smooth holes) will need a minimum wall thickness of about 1mm, and will really want more than that. And I know that the heads of the bolts will similarly need a bearing surface of about 1mm, and that both the bearing surface and the threaded hole will need to be reinforced back to the rest of the structure in order to distribute the clamping load on the part. XA: I didn't get the part with the interior Oct-Tet volume lattice at all. Is it gonna be merged with the exterior lattice? A lot of these beams will be surprisingly useful once the whole part is put together Huh? Exactly - the volume lattice (which is an oct-tet topology - see this paper for a better description than I could ever give you) will be booleaned with the surface lattices to create one structure. If you look at that volume lattice on its own, you'll notice that there are some stray beams that don't appear to be doing anything - they stick out into the middle of nowhere, and don't appear to be taking any load. But when you merge the volume with the surfaces, the situation changes, and those beams might be more useful than you would have thought. As it happens, I've been focusing more and more on surface lattices in the past few days, as they're a bit easier to control explicitly - and the changes that I make are easier to immediately grasp the effects of. The "generate multiple individual lattices and then merge them at the end" workflow really isn't optimal for this reason: it takes way too long to understand what the finished structure will work like. XA: You won't have skins in your design. I guess that for the stem to fit handlebars and steerer tubes you'll need the contacting beams to match the tubes curvature. Did you plan to design the beam shape for this or is it something you'll let for post processing. If so, do you plan to make those beams sturdier to account for grinding? I'd *love* to bend the beams around the clamp area, actually. Right now I don't have a convenient way of doing that, but I'm looking into it. Either way I'll boolean out the clamp regions before printing, so I shouldn't need to grind away much. As you might expect, my thoughts on this workflow are changing as I use it more. It's a rather finicky process, and I'm eager to industrialize it a bit - and improve the areas that are most difficult to reproduce. Added on October 29, 2015 by Spencer Wright. Note: Special thanks to Bradley Rothenberg (of nTopology) and Ryan Schmidt (of MeshMixer/Autodesk) for their continued help on this workflow. Also, both of them make awesome (and very weird ;) software that you should check out. A scenario: You've got a part that you want to manufacture with metal powder bed fusion. You've got a few mechanical features that you know you need (to mate up with other parts in an assembly) and a general sense of the design space that's available for the part you're designing. You know the mechanical properties you need (via an ISO test that the part needs to pass) and you've got a target mass (which is basically "less than the competition"), and a target cost (which is basically "similar to the competition, taking into account a ~35% margin for me"). 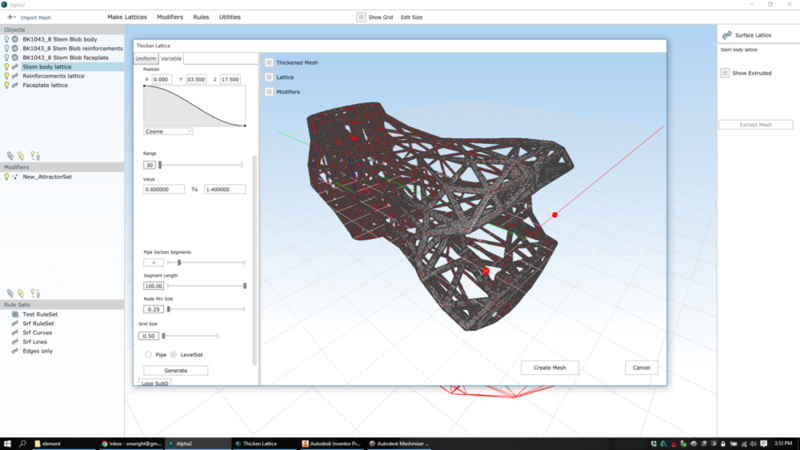 I've spent a lot of the past week going back and forth between Inventor, MeshMixer, and nTopology Element, trying to make a 3D lattice structures that are both mechanically effective and easy to manufacture. My workflow has been decidedly emergent, and it's also been counterintuitive at times; I've often found myself working backwards (away from my final design intent) in order to create the conditions where I can make progress down the line. My end goal is to design a bike stem that's sub 125g and which has minimal post-processing costs and requires minimal support structures (I'll deal with the actual dollar cost later, as it'll depend on a bunch of factors that aren't under my direct control). I've got 27.7 cubic centimeters of titanium to play with. Where do I put it? The mechanical features. This includes the two clamp cylinders (one, the handlebar clamp, is 31.8mm in diameter and split; the other, the steer tube, is 28.6mm and slit along the back side) and the four bolt holes (all M5, and all with one counterbored part and one threaded part) that do the clamping. The design space's exterior surface. In general, the stiffness of the part will be determined by how much volume it takes up, and I should generally make the part as stiff as possible. Therefore the exterior surface of the part is going to be made up of a big non-Euclidian 2D lattice. The volume of space between the mechanical features and the exterior surface. I'll want some bracing here to tie the whole part together and transfer loads from the mechanical parts over to the exterior lattice. 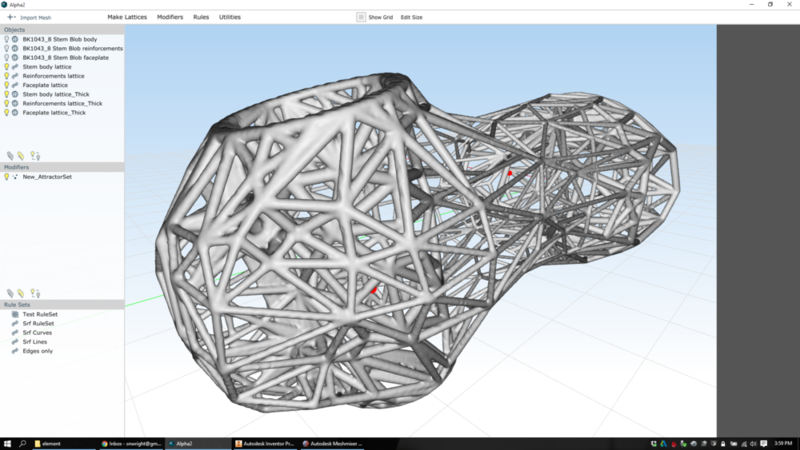 For this design, I'm using lattice structures throughout the part. I won't design any skins (I'm generally anti-skin, unless you've got fluid separation requirements in your design), instead opting to let the lattices vary in density from zero (in the middle of the part) to 100% (in areas like the threaded and counterbored bolt holes). I generally begin by remeshing the entire object at a medium-high resolution, just to get rid of the dense lattices that Inventor creates at edges and small fillets. I then choose the area that I want to be at the highest resolution (which is almost always lower than the one I chose in the first step) and remesh it. On the part's exterior, that was the bolt counterbores. Then I work my way down to the lowest resolution areas. On the part's exterior, I targeted edges in the 15mm range, but I play around with the remesh settings a *lot* until I get something I like. Then I'll go back and find areas that are still a bit high-res and remesh them again until they look good. There's a bit of back and forth here, and I haven't really figured out a one-size-fits-all workflow yet. I DON'T worry about geometric accuracy much during this process; I assume that I'll need to clean up the geometry at the end (after I've generated the full lattice structure - more on this in a future post) anyway. At this point, I decided that I really wanted to stretch the entire exterior lattice out so that more of the beams would be horizontal. The part will probably be built on its end, so these will be easier to build as a result. So I go back into MeshMixer, transform the part down (it happens to be the Z axis here) by 50%, and remesh the outer skin. Then I transform it back up to 100%, stretching everything out. Now, there's still a lot wrong with this. There are a *lot* of overhanging faces. The threaded bolt holes aren't very well connected to the outer mesh, and there's probably too much material on all of the flat faces (where the slits/slots are). I'm also over my mass target - my total is 34.1 cubic centimeters, and my target was 27.7. But there's a lot right with the design, too. My beams are about the right size throughout, and I've been able to (more or less) distribute my mass where it will matter most. And while the aesthetics of the part aren't exactly what I'd like them to be, they're not far off either. First, I need to make overhanging faces easier to eliminate. Some part of this *needs* to be happen when I remesh a surface (assuming I'm using the surface topology to determine the lattice topology). 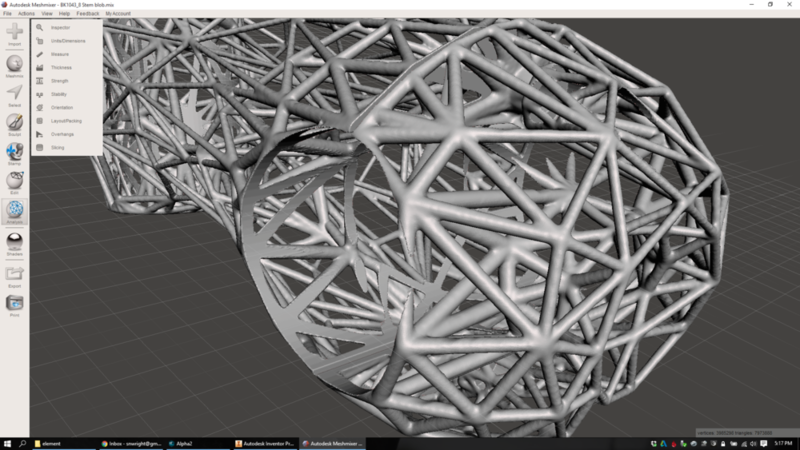 Ditto with volumes - I need to be able to stretch the lattice out so that it isn't horizontals all over the place. I also need to be more careful about directing my volume lattice where it'll be more effective. It's possible I should break it up into a few regions - some near the mechanical features, and one in the middle of the part - but I'm concerned that if I do that, I'll never get the two to tie together. Either way I need a denser volume lattice at the bolt holes, and I need to be able to tie the volume lattice beams up to the other regions of the part. 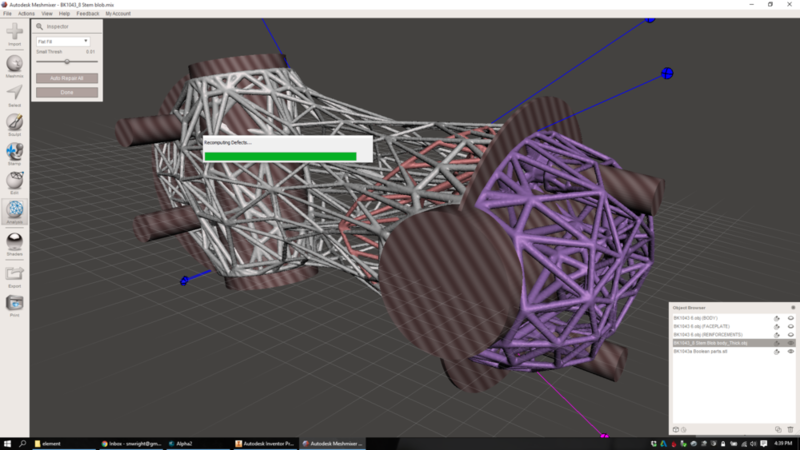 I should probably play with modifying my mechanical features back in Inventor to make them more conducive to lattices. This might involve warping the clamp cylinders somewhat to reduce overhanging faces... or drilling the threaded holes through the part so that they connect to the exterior surfaces... or puncturing the flat faces so that they aren't as massive as they are in the current design. Added on October 23, 2015 by Spencer Wright. 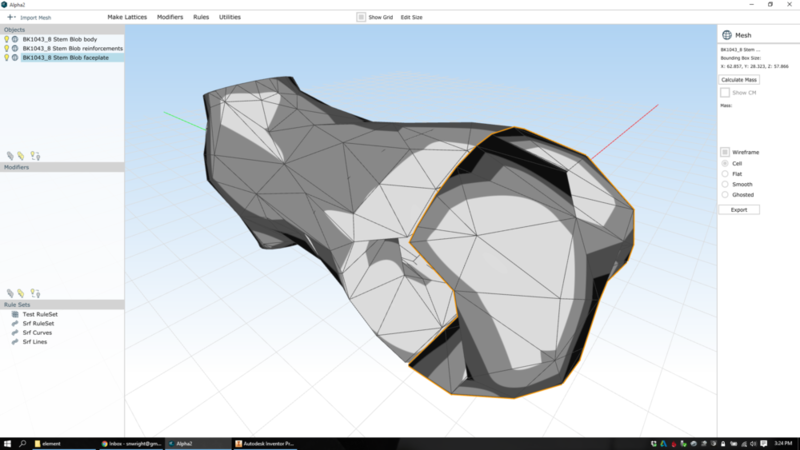 Here I've taken an STL from Inventor and brought it into MeshMixer, where I'm remeshing the outside skin. I'm doing this so that I can then create a surface (as opposed to a volume) lattice in nTopology Element. If I tried to create the mesh directly from Inventor's STL, it would be much to fine and have a bunch of artifacts from the way that Inventor processes T-Spline surfaces (Inventor breaks the surface up into panels, and then subdivides each one individually - you can see the panel boundaries in the beginning of the gif), and would also be *way* too fine to be used as a scaffold for a surface lattice. By remeshing at a lower resolution - and playing with MeshMixer's remeshing settings a bit - I can get to a topology that's way better.